After suicide bombing in Istanbul that killed three Israelis, Israel praises the conduct of the Turkish officials, Rivlin calls Erdogan. 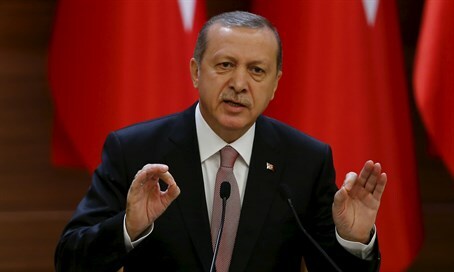 The phone call Wednesday from Israel’s President Reuven Rivlin to his Turkish counterpart, Recep Tayyip Erdogan, represents “a subtle but clear sign of improvement” in the relations between the two erstwhile allies, according to The Media Line. Rivlin called Erdogan after the Turkish president sent a letter of condolence to Israel, following the suicide bombing in Istanbul Saturday which killed three Israelis and an Iranian citizen. ISIS took responsibility for the blast. Israel’s Foreign Ministry chief Dore Gold praised the conduct of the Turkish officials who assisted in the evacuation of Israeli tourists and in returning the bodies of the three Israelis who were killed. “It is clear that the Turks went above and beyond to coordinate with Israel,” Gold told Army Radio. Rivlin thanked Erdogan for the condolences he sent Israel and for the assistance from the Turkish authorities, in a phone conversation that is being described as the highest level of interaction between the two governments in years. In December, it became known that Israel and Turkey were currently holding negotiations in an effort to restore diplomatic relations, after a long period of tension that included the Mavi Marmara debacle and Turkey's subsequent demand for compensation. “The attack in recent days in Istanbul has created a closer atmosphere, it’s certainly warmer, but it does not remove in anyway the real obstacles that we have with the Turks in the context of reconciliation and normalization,” Emmanuel Nahshon, spokesperson for the Israeli Ministry of Foreign Affairs, told The Media Line. Eran Lerman, from the Begin-Sadat Center for Strategic Studies, said Turkey appears to be making real efforts to make up with Israel. “Turkey has come up against the very dramatic reality that it is in direct friction with Putin’s Russia and that it actually needs to build up normal relations with Europe and the West,” he said. And Ofer Israeli, an international security policy expert at the Interdisciplinary Center in Herzliya, told The Media Line: “The Turkish foreign position is very bad right now especially after the Russian involvement in Syria and the Turkish attack on the Russian jet."